Being a student and lover of art, I have been fascinated with civilization’s need to create a visual record of our existence. 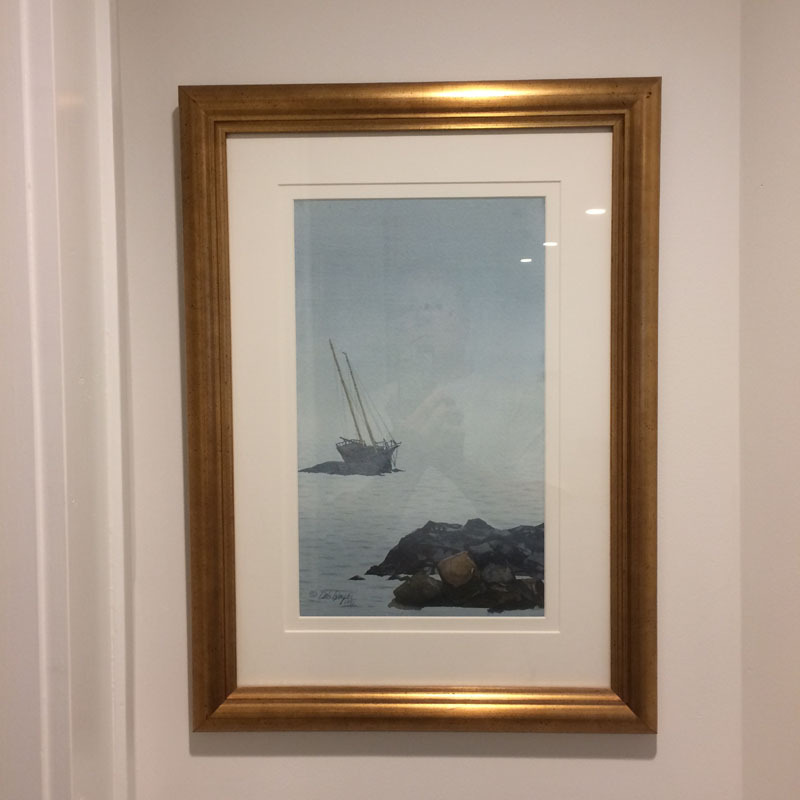 For some reason I have always been attracted to paintings – I suppose that’s why I do what I do at the gallery I am supposed to be running (when I’m not here at the Adventures Project). Since this is a woman cave- I thought I would present some cave art. 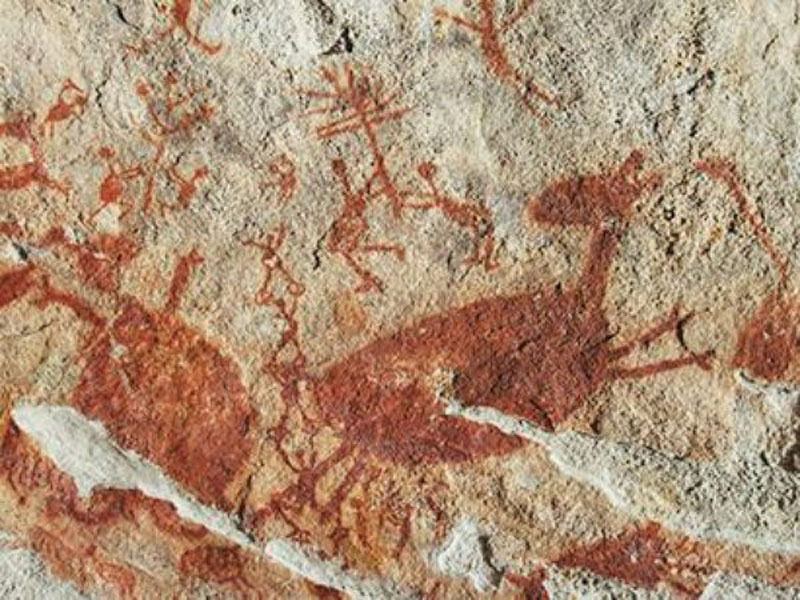 An example is this painting that is thought to be the oldest cave painting in the world. Found in Indonesia in 2014 you can read about it here. 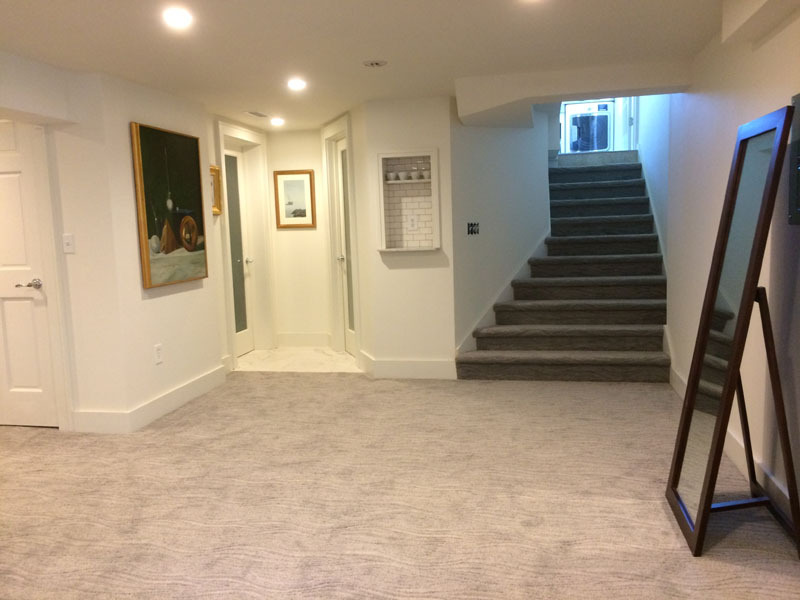 When the carpet was installed in the basement it was just hours before pieces of cast off furniture arrived from our house we currently live in. Oh, and some cave art as well. 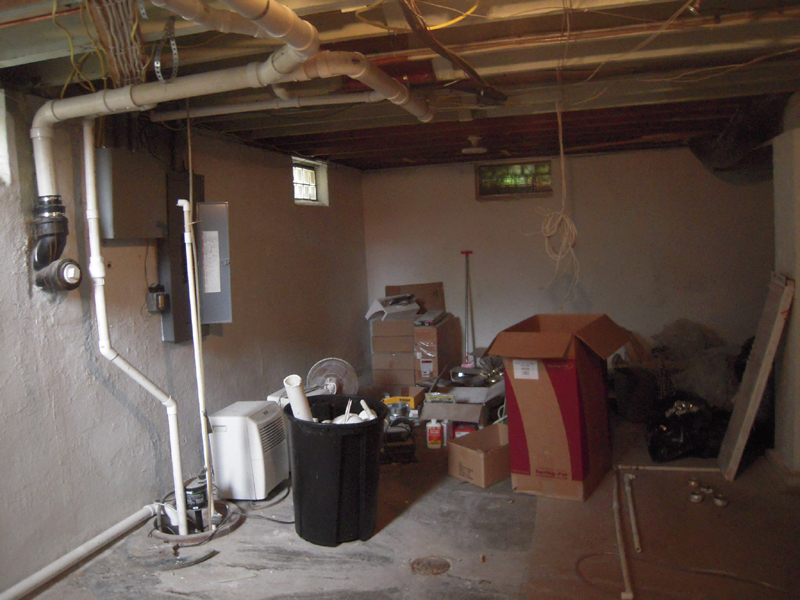 It’s been 6 years since any livable space has existed in this house – unless you count a bathroom. I plopped down some chairs and a coffee table and went to pull some art from storage. Just a few pieces to finally get something on the walls – after all, that’s one reason for doing this crazy project in the first place. This was my wife’s first request. 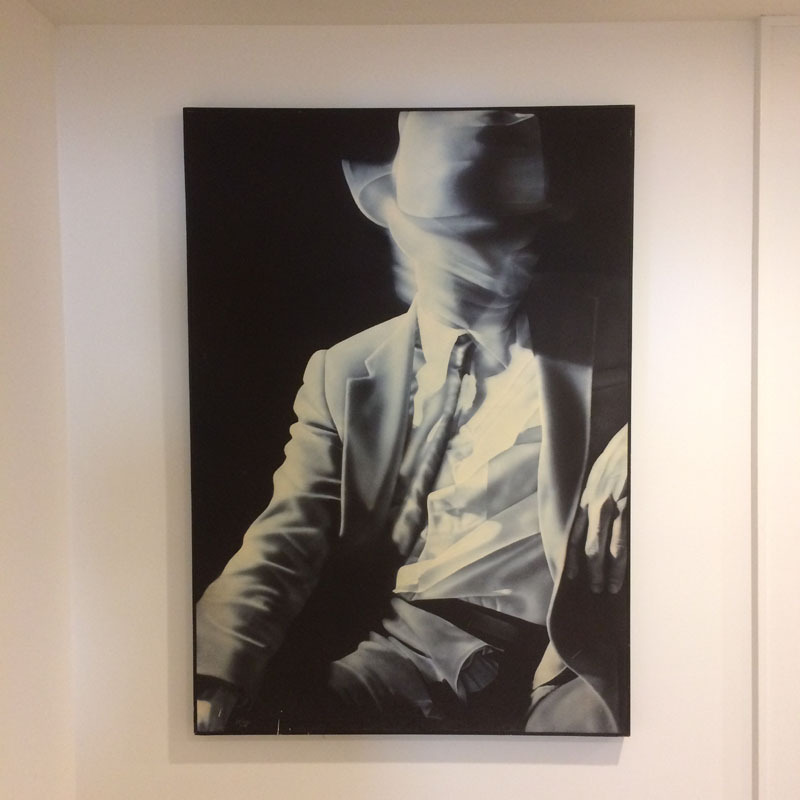 This is an acrylic on canvas painting by a regional artist Cynthia Thorp titled ‘A Moment of Him” – well it is a woman cave after all. 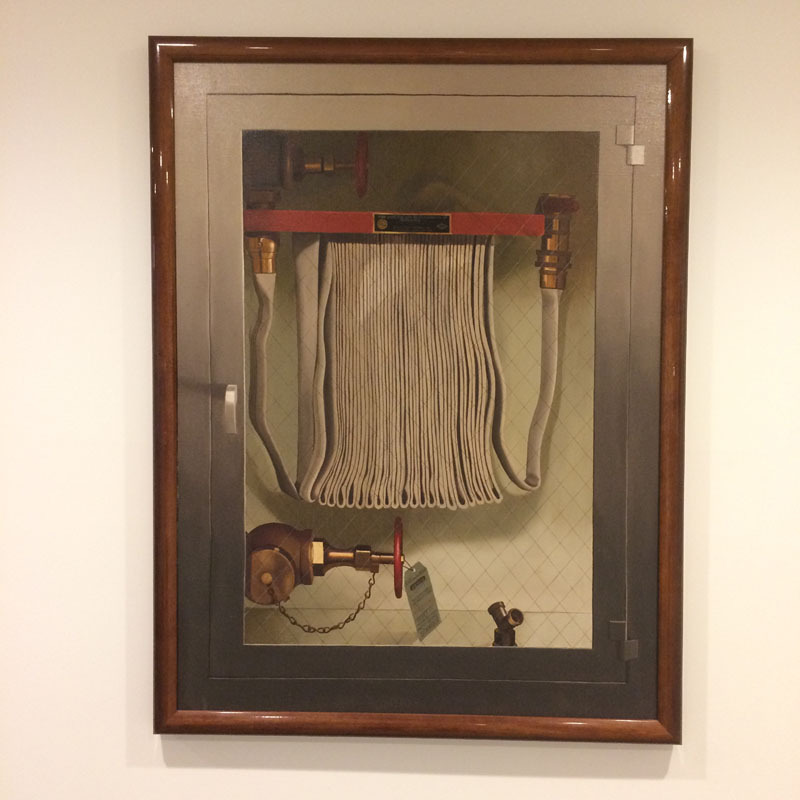 This oil painting is titled “Fire Fighter” by the late Mary Louis Schrodt of Louisville. It’s wonderfully realistic, but unfortunately not functional You can read about her here. 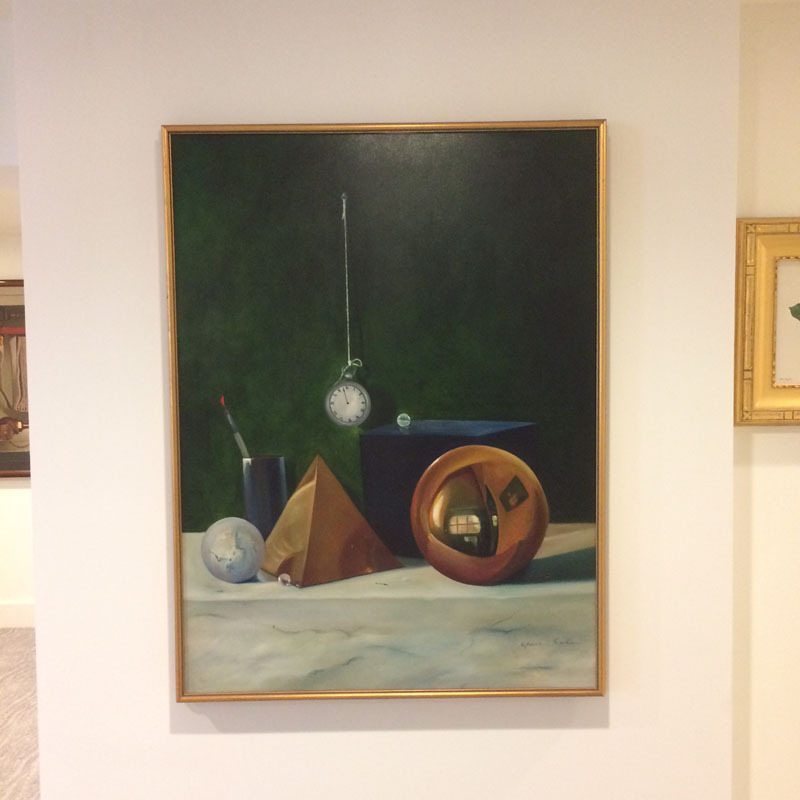 She selected this Oil painting by Grace Cole titled ” Requiem of Frozen Tears”. Grace is still a working artist and you can read about her here. She picked this little watercolor by regional artist Deb Boyer. My wife came from an island, so this is a reminder of home for her. And this little oil painting by the only male artist in the cave. 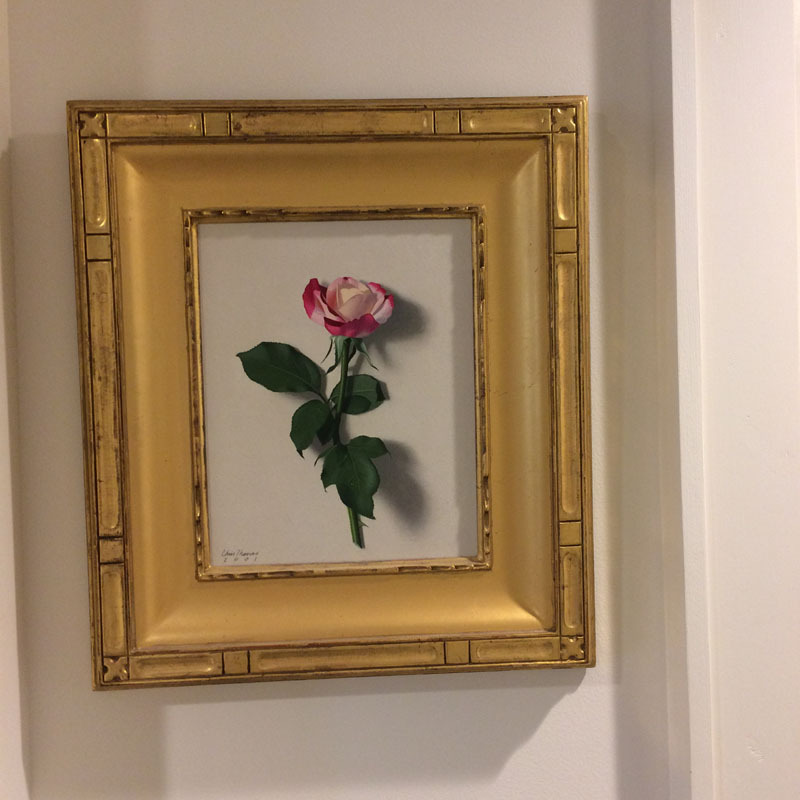 This rose study is by Chris Thomas, an artist we helped develop many years ago. His web site is here. Of course, to my wife, the best art is her coffee cup sculpture. It feels nice to have someplace that’s not full of sawdust and has art on the walls. Just a quick update to let everyone know I’m alive. I’m working like the dickens at the MisAdventures project, so more to come. I had enough of the old marble top my neighbor gave me to make a little shelf. So after cutting and a little polishing I grooved the bottom of the shelf to receive some stainless steel pegs that I had drilled and set in the sides of the niche. A little tweaking, a little grout – bada- bing, bada-boom. Done and move on. 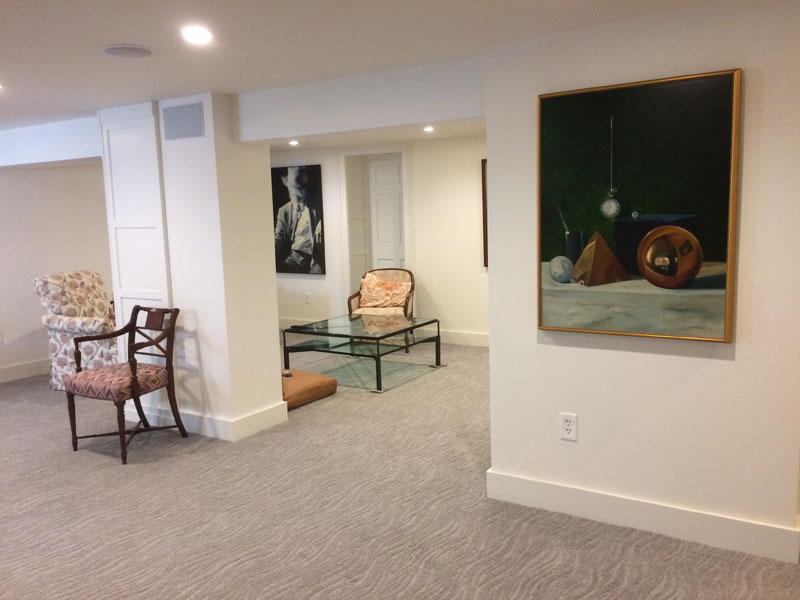 Good thing too – as I had just enough time to put the final coat of paint on the walls and finish the baseboards before the carpet installers arrived. Hang in there – things are going to get finished. You can see the stringers are ready and some of the moisture/mold defense green board is up – I needed to get the stair area wrapped with dry wall before the stairs go in. And finally the 45 degree angle 8″ wide stair treads bid farewell. That’s my little well pump sitting there below. 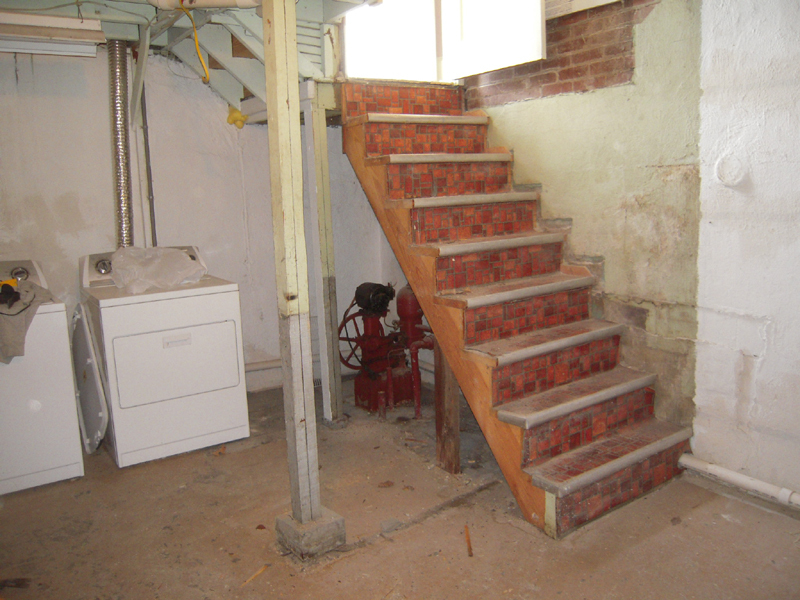 Because of clearance issues, the right hand part of the stairwell is against the concrete and brick basement wall. 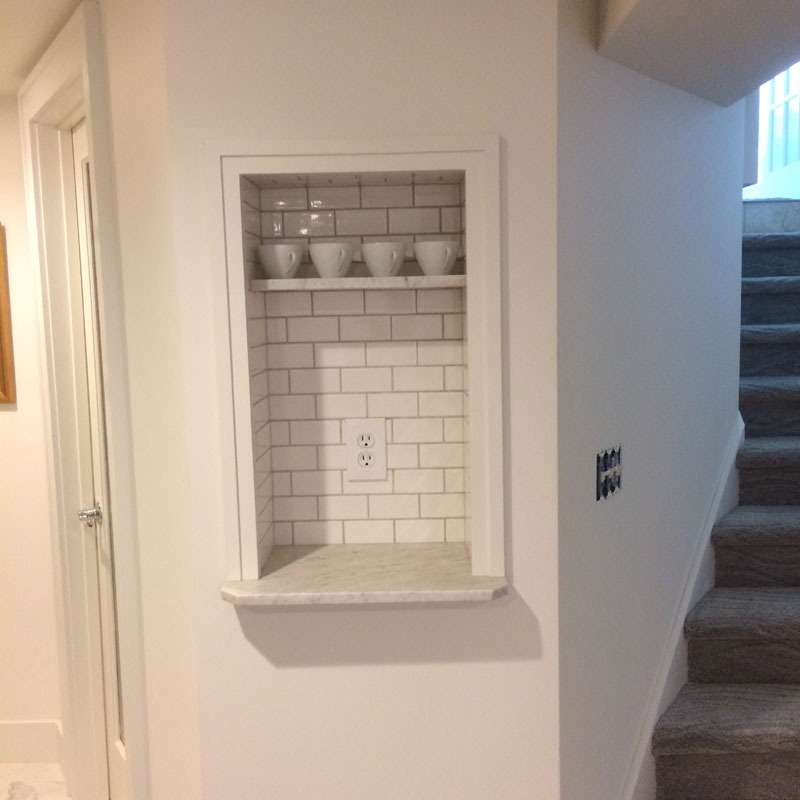 I couldn’t frame out the wall next to the steps or the stairs would be very narrow. I used 3/4″ foil faced insulation in this area. I attached it the the wall with nylon anchors and washers, with PL adhesive. The diagonal wood will allow the lower section of wall under the stringers to be framed out and foam insulated. Once that was finished I made a quick cardboard template of the step nosing to use later when cutting drywall and trim pieces. It’s a good idea to make guides like this when the area is still open and easy to access. The drywall was cut and glued to the anchored insulation panel with drywall PL adhesive. Clamps are used to keep pressure on the drywall while the adhesive sets. The lower section is done the same way. 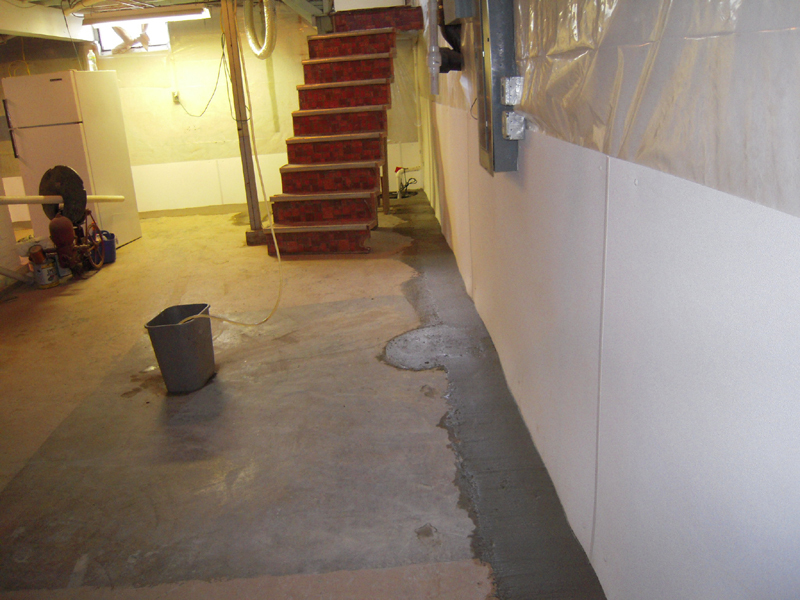 Additional blocking is placed in the wall to support the stair treads at the wall. The wall behind the ladder and and the right hand side were framed out for foam insulation. This area will have in-wall speakers, so a little layout is needed before the spray foam goes in. Here is the viewing position and the proper angle for speaker placement.All of the structured wiring is run and additional conduits were placed in case I need to run additional wiring later. I made wall bucks at each speaker location. These will make a void in the spray foam, but allow for insulation behind the speakers..
After the closed cell foam goes in, the plastic covered bucks are removed leaving a place for the speaker. Some one asked about a floor plan – well I didn’t have one so I drew this one in an old version of Microsoft Publisher. Who needs SketchUp? 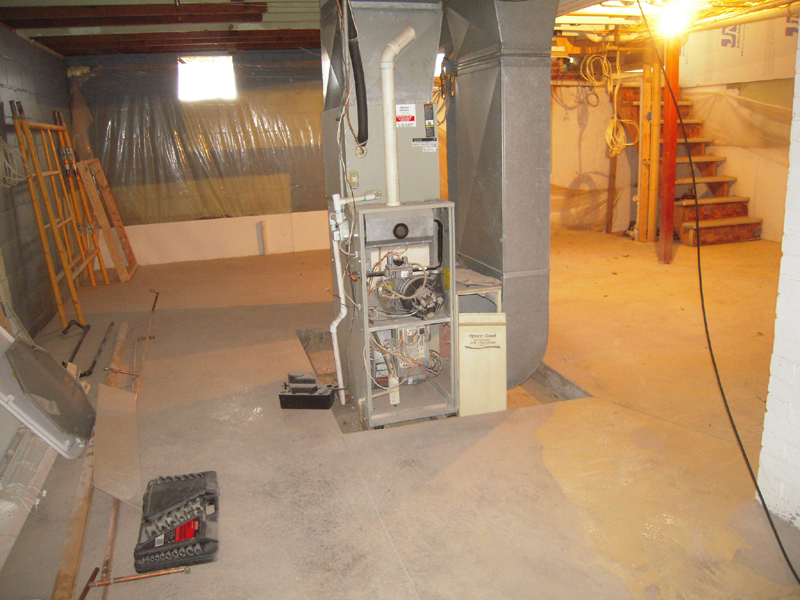 I get a little room downstairs with the furnace and hot water heaters – she gets the rest. OK, you that have been with me from the beginning know one thing – this renovation has gone on way too long. We’re 5+ years and counting – and you know my wife has asked me a couple of times over the years, um…just when might we move into this place you play at everyday? So like any manly man – I puffed up my chest and walked right up to her and answered the question directly. No mealy-mouthed beat around the bush kinda guy here. I did what any sensible husband would do in the same situation – I asked her how big she wanted the steam shower in her new woman cave. Since the weather has turned to winter, no more outdoor work for the time being. 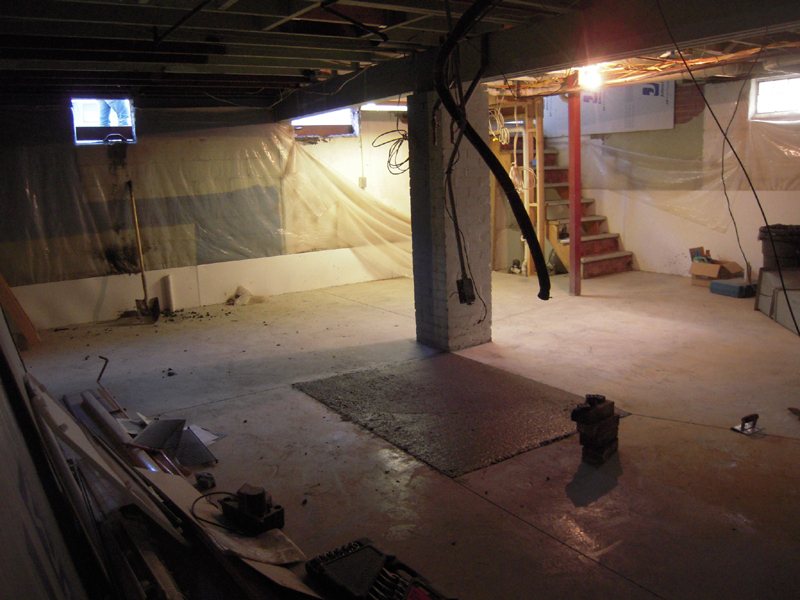 So I have turned my attention to the basement – which I have relinquished ownership to my wife. Let’s take a little tour, shall we? 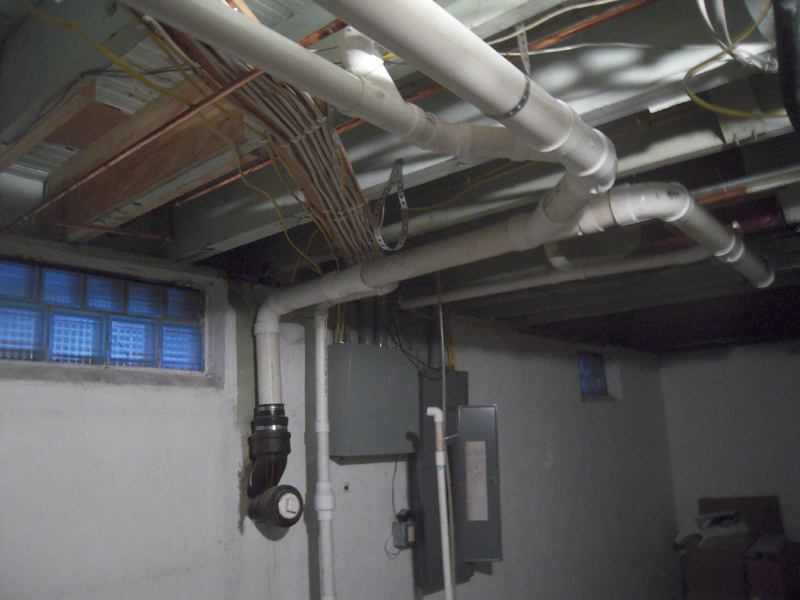 All the plumbing and that hack job of electrical will have to go to get a smooth ceiling. And look at this place! 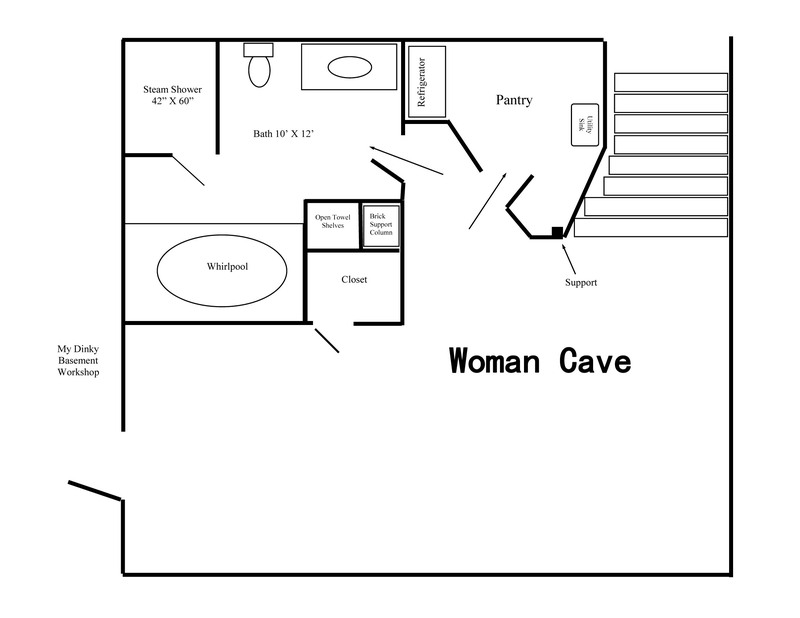 A cave maybe, but Woman Cave never! Well, it’s time to make something out of this chaos. Not looking too promising – what a mess! New stairs are in order, and we’ve got a new washer and dryer upstairs in the mudroom, so this all has to go. 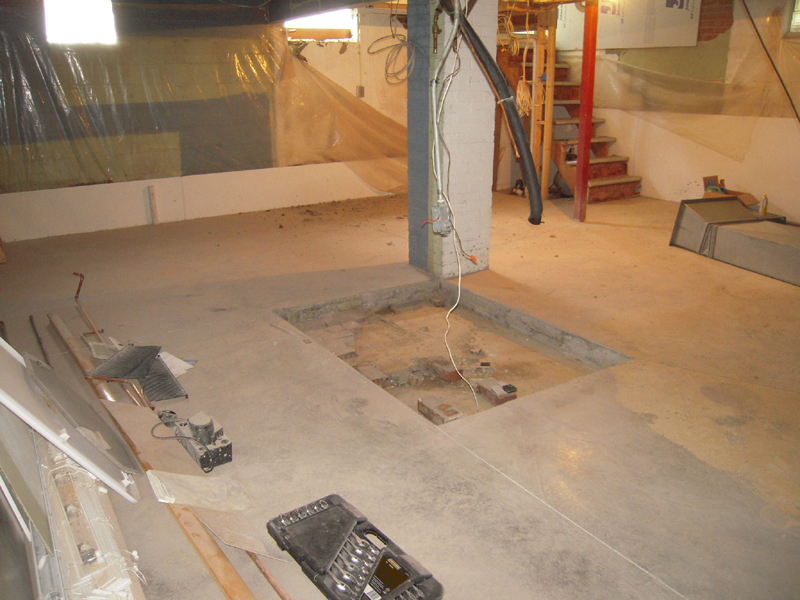 First up is waterproofing which is covered under the basement renovation links. 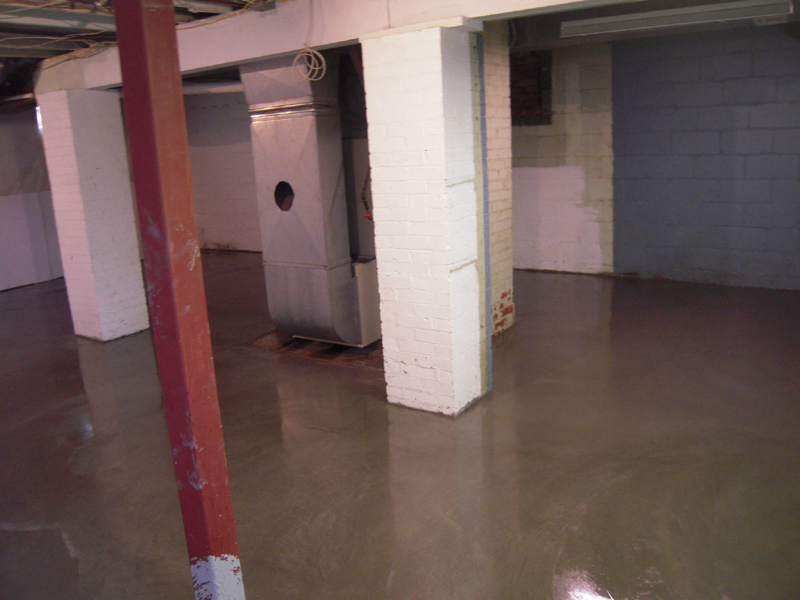 But once I had the brand new floor poured I decided that I should have moved that pesky furnace – since I decided to rip out all the duct work and start over. And in no time we have no heat! Good thing it was summer. Of course then we have to patch the hole in the floor. 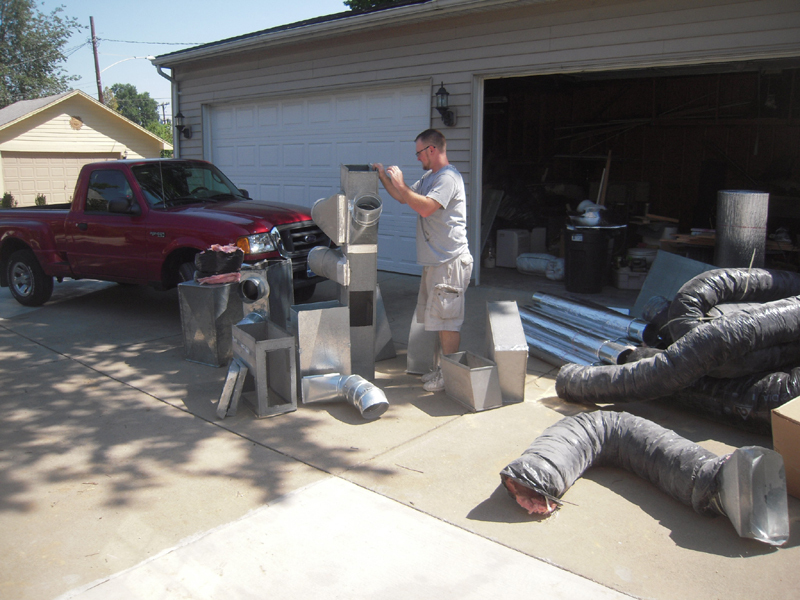 And a pile of old duct work the Heating and Air guy is trying to figure out how to git rid of. Stick around – this could get interesting.